Anderson da Silva is a Brazilian mixed martial artist and former UFC Middleweight Champion. Silva held the longest title defense streak in UFC history until 2013, with 16 consecutive wins and 10 title defenses. He has 12 post-fight bonus awards. 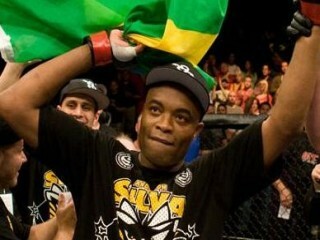 Silva is ranked as the #1 middleweight in the world by multiple publications including Sherdog and is the consensus No. 1 pound-for-pound mixed martial arts fighter in the world according to ESPN, Sherdog, Yahoo! Sports and other publications. According to an article in Fight! Magazine, Silva’s poverty stricken mother left him and his older brother with her sister’s family in Curitiba, Brazil when he was only four years old. Silva’s aunt and uncle, therefore, found themselves supporting five children on a police officer’s salary. “When I started out, Jiu-Jitsu was really an elite thing in Brazil, and there was some prejudice towards poorer kids, so I had to learn things on my own,” he told Fight! Magazine. “Some of my neighbors started doing Jiu-Jitsu, so I started watching it, and then started rolling with them. It wasn’t organized training, but it was better than nothing.” Despite this, Silva's supportive family did find the money to pay for Tae Kwon Do lessons (age 12). Silva then moved onto Capoeira before settling on Muay Thai by the age of 16. Though Silva indicates that he lost his first bout to Fabricio Marango, this fight does not appear on his official record. Officially, Silva lost his first bout to Luiz Azeredo in a Meca World Vale Tudo event by decision. In his next fight within the same organization, he knocked out Jose Barreto after only 1:06 had gone by in the initial round. Silva's MMA career took a nice turn when he won nine straight fights between 2000-03. Along the way, he defeated the well-respected Hayato Sakurai by decision to become the Shooto Middleweight Champion. Silva went a mediocre 3-2 while fighting for the PRIDE Fighting Championships. Along the way in 2003, he and Chute Box parted ways over a bitter money argument. Later, Silva heard that Chute Box ordered PRIDE to refrain from giving him any fights or they would pull superstar Wanderlei Silva from their roster. That’s when Antonio Rodrigo Nogueira offered a friendly hand to train with him. It was a match made in heaven. Silva improved his ground game immeasurably, gaining a black belt in Brazilian Jiu Jitsu in 2005. Further, Nogueira’s clout erased a good portion of Chute Box’s control. To say that a new and improved Anderson Silva came to the UFC on June 28, 2006, is an understatement. Silva simply destroyed Chris Leben, a tough fighter, in his UFC debut after only 49 seconds by way of knockout. Then he blew former UFC Middleweight Champion Rich Franklin out of the water with his dangerous Muay Thai clinch after only 2:59 had gone by. Next up, he fought his way back from near defeat against Brazilian Jiu Jitsu ace Travis Lutter, only to end up submitting him. On August 7, 2010, Silva faced Chael Sonnen for the UFC Middleweight Title at UFC 117. In the first round, Sonnen stunned Silva with a punch before taking him down and dominating from the top position, landing multiple blows. The following three rounds played out in a similar fashion, going to the ground early with Sonnen dominating from inside Silva's guard. In the fifth round, Silva slipped after being tagged by Sonnen's left hook and the challenger took advantage by once again establishing a top position and delivering strikes to Silva. With about two minutes left in the round, Silva was able to lock up a triangle armbar on Sonnen, forcing Sonnen to submit at 3:10 of Round 5. Silva was hit more in the fight than in his entire UFC career up till that point. According to CompuStrike, in his first 11 UFC fights, Silva was hit 208 times. Sonnen hit him a total of 289 times. After the bout it was revealed that Sonnen would have won a judges' decision. All three judges had Sonnen marked as the winner of all four rounds, judges Nelson Hamilton and Dan Stell had Sonnen taking Round 1 10–8, as well as Hamilton awarding the challenger another 10–8 total in Round 3. Silva faced Vitor Belfort on February 5, 2011 at UFC 126. Belfort was expected to face Yushin Okami on November 13, 2010 at UFC 122, but was replaced by Nate Marquardt. After a "feeling out" period of about two and a half minutes in the first round, Silva and Belfort started to trade strikes. Silva landed a front kick to Belfort's jaw and followed up with punches to the grounded challenger. Referee Mario Yamasaki stopped the fight at 3:25 minutes into the first round. With the win Silva handed Belfort his first KO loss in 28 career fights and extended his record streak of title defenses to eight. Silva then faced Yushin Okami on August 27, 2011 at UFC 134. He defeated the Japanese middleweight by TKO at 2:04 of round 2, displaying skilled head movement and accurate striking. Silva faced Chris Weidman on July 6, 2013 at UFC 162. He lost by knockout in the second round after getting caught while clowning around, relinquishing his title as the longest running title holder in UFC history. UFC president Dana White and other publications have called Silva the greatest mixed martial artist of all time. In the end, Silva is one of the most proficient strikers to ever compete in MMA. View the full website biography of Anderson Silva.